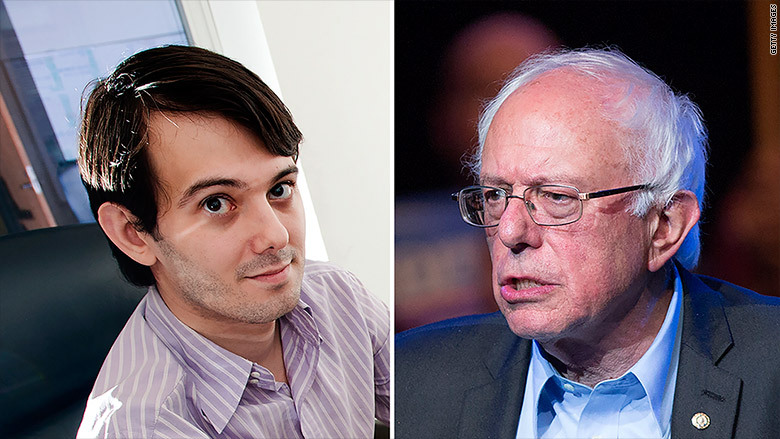 Pharma executive Martin Shkreli is pretty peeved at Bernie Sanders. The Turing Pharmaceuticals chief executive was branded America's least favorite CEO when he hiked the price of Daraprim from $13.50 to $750 -- or about 5,000%. Daraprim is used by some HIV patients and others to treat a life-threatening parasitic infection. The ensuing controversy has become a talking point in the 2016 presidential race. Democrats Sanders and Hillary Clinton both criticized Turing. Sanders has proposed regulating prices for drugs, saying the lack of such price controls in the United States has "been an unmitigated disaster." Shkreli recently endorsed Sanders' bid for the Democratic ticket. But Sanders effectively rejected Shkreli's $2,700 donation by saying he would give a donation of the same amount to a health clinic. Now Shkreli's backing has soured. He tweeted Sunday that he's so angry at Sanders that he "could punch a wall." Shkreli told CNNMoney on Sunday night that he donated to Sanders "in hopes of meeting him and discussing" pharmaceutical policy. "I find it bizarre that he won't engage me because he's been willing to use my name," Shkreli said. "He singled me out, but dozens of drug companies have done what I've done." Shkreli said he hasn't spoken directly to any of the current presidential candidates and has not decided who he will back for president.